The SSL 1200 “VCO 1” is a compact, high quality, precision voltage controlled oscillator for MU-format modular synthesizers, with an impressive number of functions for a single width VCO. 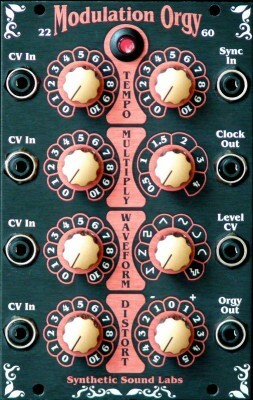 Capable of accurate tracking over many octaves, it is also capable of acting as a relatively flexible low-frequency oscillator (LFO). With a time-tested sawtooth core, the 1200 uses highly matched integrated transistor pairs and quality temperature compensating resistors provide excellent stability. One of three common waveforms – Triangle, variable width Rectangle, and Sawtooth may be switch selected to the Wave output, and a separate Sine output is continuously available. Sync (“hard sync”) input can be used to lock two oscillators together to prevent “beating” effects or to provide dynamic timbral variations. 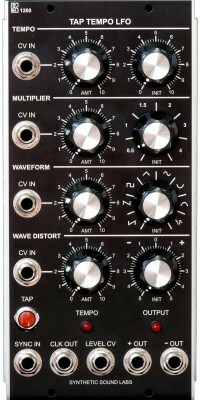 Modulating the 1200 VCO’s CV IN jack opens up a whole new range of sonic possibilities. Though not necessary in most cases, the input signal should be a clean rising edge (i.e. from a pulse or sawtooth wave) to achieve best results. - COARSE: Wide range pitch adjustment covering approximately 12+ octaves - (approx. 2 Hz to 20K Hz). There are 7 very usable octaves. - FINE: Allows smaller and more precise range than the Coarse control (approx. 10 semitones). - CV AMT: Amount of control voltage attenuation from the CV Input (see below) that modulates the VCO’s frequency. Fully counter-clockwise is zero modulation; fully clockwise is 100% modulation. - FM LIN/EXP: Selects between linear and exponential modulation from the CV AMT control. - PW: Selects initial of duty cycle (pulse width) of the pulse wave - 12%, 25% & 50%. 12% provides a thin, reedy tone not unlike that of an oboe or clavinet/harpicord. 50% provides the classic hollow-sounding full square wave like a clarinet, while the 25% setting is a compromise setting between those two extremes. These percentage values are only the initial duty cycle (defined as the amount of the waveform that is positive voltage); the overall shape can be modulated via the PWM jack (see below) for timbral change over time. Please note that this switch only has effect when the pulse wave is selected (see below). - WAVE: Selects between triangle, pulse, and sawtooth waveforms. When in the pulse position, the PW % and PWM controls can be altered for a wide variety of tonalities. - 1V/OCT IN: Allows the VCO to track at 12 equal tempered semitones per octave. 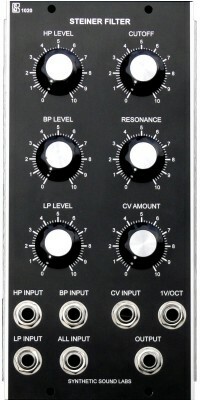 - CV IN: Provides an input for control voltages to modulate the frequency of the VCO. - PWM: Modulates the Pulse duty cycle when the pulse waveform is selected. This control has no effect on other waveforms. - SYNC (hard): Allows the frequency of the VCO to be slaved to another frequency, creating interesting harmonic and timbral relationships. - OUT: Output selected by the WAVE switch. ~10V P-P; +/-5V. - SINE: Continuously available sine wave. ~10V P-P; +/-5V. +15V at 27ma, -15V at 26ma, Synthesizers.com (DOTCOM) 6 pin MTA standard. And i have to tell you this, i have 8 Q106 and they are great, but im using your 1200 as a solo oscillator, the triangle wave on this is nothing that i never heard before, i call it a soft, tender, romantic, sadness sound. Have a lots of Moogs and other stuff but this one…….! I just wanted to let you know that the VCO 1200 I ordered from you arrived yesterday (1/25) and I’m very pleased with the quality of your products. After letting the VCO run for a couple of hours I was impressed with both its pitch stability and its audio performance. The saw and rectangular waves sound nice and fat, and seem to have plenty of overtones to play around with. It sounds especially nice when under some FM to create vibrato — a very musical sound. And it tracks 1V/octave perfectly throughout my keyboard’s 5-octave range. I really like the two [1200 VCO’s] I received previously. They play well with my DotCom system and sound great!